Collection "THE LOOK OF LOVE"
the first handknitted collection for fine bridal knitwear. super cuddly bolero jacket made of fluffy yarn. Perfect for cuddling in, about waist-long. Completely in pearly pattern (see photo) or in smooth pattern with collar in pearly pattern (see model "medium"). super cuddly bolero jacket made of fluffy yarn. Perfect for cuddling in, wearable with shawl collar, about hiplong. Completely in pearly pattern (see model "mini") or in smooth pattern with outside edge / collar and arm ends in pearly pattern (see photo). super cuddly, extra oversized bolero cardigan / cape made of fluffy yarn. Perfect for cuddling in like into a coat, wearable with shawl collar, extra long. Completely in pearly pattern (see photo) or in smooth pattern with edge / collar in pearly pattern (see model "medium"). Also perfect to style with a belt. 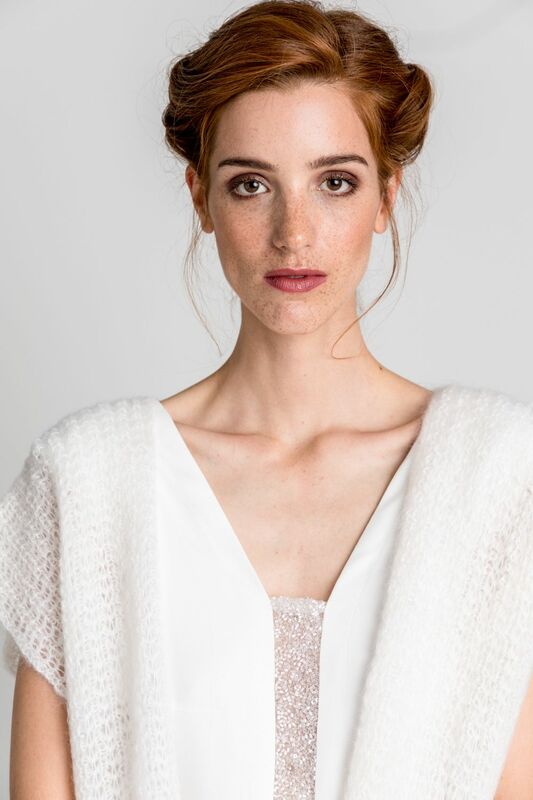 Silk soft, airy bridal cardigan in silk-mohair yarn, with ¾ sleeves and raglan shoulder. Perfect on delicate dresses and over tops and skirts. Leaves your skin on back and arm shine through. Fit: fitted. Cuddly soft bridal-balletjacket made of luxurious merino-silk yarn, with tie belt, for an elegant classic look, like a ballerina. Straight or with pearly pattern. On request also in other yarns in the colors white, light pink and light gray. elegant, chunky bridal jacket with a overcut, short sleeve and real, large nacre button to close. The button can also be placed in the middle underneath the bustline, or without a button with a folded collar for a look like a biker jacket / blazer. On request, also own buttons can be send in to sew on the jacket. Heavenly soft, oversized bridal cardigan in fluffy mohair-wool blend. Perfect for all styles, also combinable with a cool belt to accentuate the silhouette. You never want to take it off again. ultra-casual, oversized bridal sweater with V-neck made of feathery, voluminous silk-mohair yarn in absolute luxury quality. Casual on flowing clothes, skirts or pants. Perfect for everyday life after the big party. Silky soft triangle stole made of luxurious silk-mohair yarn, embraces you like a feather and lets beautiful backs show through. luxurious bridal bolero with extraordinary pattern made of fluffy yarn, waist-length approx. Fit: fitted. flamboyend oversized bridal-bolero, wonderfully soft, elegant yet cool. elegant, silky-soft bridal vest, with cropped arm. elegant, silky-soft bridal coat, with cropped arm. Filigree pattern, knee-length. Butterfly, silky-soft bridal-cape with cropped arm. Filigree pattern, calf length. chunky bridal-stole, big scarf made of 100% pure wool combined with sequins & lurex in delicate silver. chunky bridal-bolero with fluffy 3/4 sleeves. Pure wool combined with sequins & lurex in delicate silver. chunky bridal-bolero without sleeve. 100% pure wool combined with sequins & lurex in delicate silver. elegant oversized bridal-bolero, kuddely and tender, casual yet special. elegant, extra-oversized bridal-bolero with very wide sleeve. cool boho-bridal-vest, soft and tender, casual yet extraordinary. silky-elegant bridal-stole, with real ostrich feather trim. Also available without feather-trim. silky-elegant bridal-bolero with wide sleeve. Fit: oversized. elegant, fluffy bridal-bolero with wide sleeve. soft and tender bridal-sweater with 3/4 sleeve, ca. hipster long, with straight sideline. tender bridal-cardigan with ¾ sleeve. Slight A-line. Cardigan can be knitted without A-line as well. Wearable with open back the other way round, to be hold with a brooch e.g. elegant, chunky bridal-cape, pelerine made of pure ORGANIC WOOL with real marabou-feathered collar. 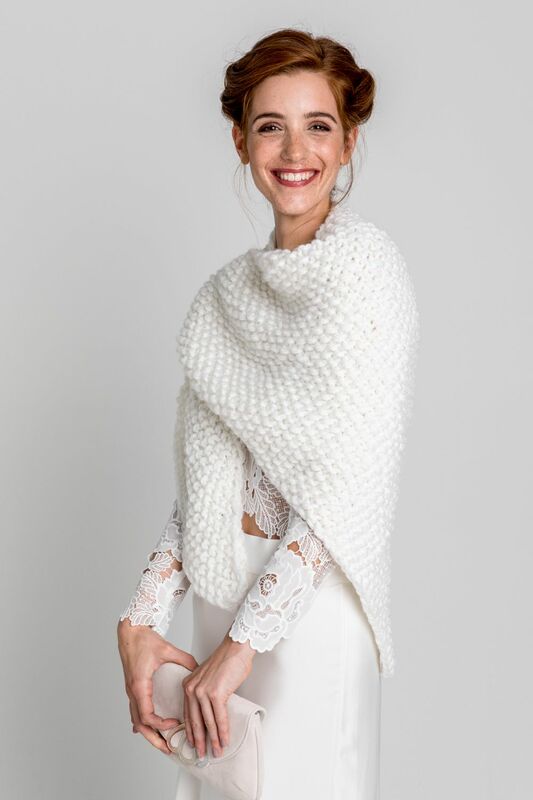 cool, chunky bridal-cape, hip length, made of pure ORGANIC-WOOL. elegant, nonchalant bridal-blouson, bridal-pilot-jacket with zipper. fine, matt-shimmering natural yarn with delicate sequins & lurex. Buttons and zipper also available in gold or silver. material: 70% viscose, 26% alpaka-superfine, 4% wool, sequins & lurex. cuddly bridal-bolero with half sleeve . Fit: fitted. silky bridal-bolero with half sleeve made of mohair & silk with sequins. soft and tender bridal-bolero. Fit: oversized. soft & tender bridal-bolero with half sleeve. Fit: fitted. Short bridal-cape with elegant hoody and binding cord. Each piece a unique piece! Our bridal-accessories are individually handcrafted with love to detail for you. Inspired by the worlds most besung and beautiful topic of LOVE, the first collection and models found their names by songtitles. Most questions about the collection, ordering and deliveryterms are answered by our FAQ. For orders please feel free to contact us via phone or mail at: atelier@marryandbride.com. directly under www.marryandbride.com or exclusive selected bridal boutiques.